On November 1, twenty-nine participants in training session for restorers of cultural properties hosted by the Agency for Cultural Affairs visited the Institute in order to view work involved in the conservation and restoration of cultural properties. 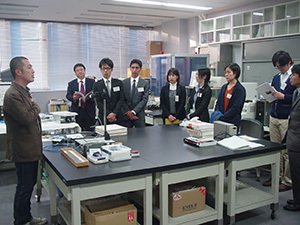 They toured the Library of the Department of Art Research, Archives and Information Systems, the Performing Arts Recording Studio of the Department of Intangible Cultural Heritage, and the Conservation Laboratory, the Chemistry Laboratory and the Scanning Electron Microscope Laboratory of the Center for Conservation Science and Restoration Techniques. As part of the “Study on Digital Imaging of Cultural Properties” research project of the Department of Art Research, Archives, and Information Systems, high-resolution images of a Painting of the Thousand-armed Kannon (a National Treasure) in the Tokyo National Museum were taken November 1. This photography was in accordance with a “joint study” between the Institute and the Tokyo National Museum and follows the study of a Painting of the Akasagarbha Bodhisattva (also a National Treasure) last year. The current images were taken by the Institute’s SHIRONO Seiji with the assistance of TAZAWA Hiroyoshi and OKIMATSU Kenjiro of the Tokyo National Museum. KOBAYASHI Tatsuro and EMURA Tomoko were also involved in the project. A Painting of the Thousand-armed Kannon (a National Treasure) is a typical Buddhist painting from the Heian Period. Buddhist paintings from the Heian Period display delicate beauty in subtle features that distinguish these works in the history of Japanese paintings. Thus, observing the subtle features displayed is crucial. The current images surpass what is visible with the naked eye. Beauty unique to Buddhist paintings from the Heian Period is apparent in the painting’s subtle features. In the future, the Institute will jointly examine the information obtained with specialists from the Tokyo National Museum. 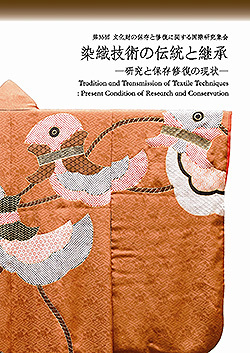 A report on the 35th International Symposium on the Conservation and Restoration of Cultural Properties, “Traditions and Continuation of Textile Techniques: Current Status of Research and Conservation,” was published at the end of November. 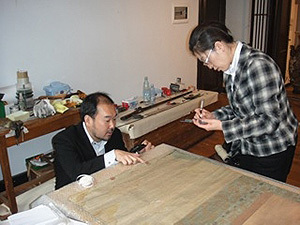 The symposium was held from September 3–5, 2011 and featured presentations by domestic and foreign experts from various disciplines such as textile makers, restorers, curators, and researchers. The report features all of the reports by those experts in order to share the topics discussed at the symposium with a larger audience and encourage further discussion. Plans are to make a PDF version of the report available on the website of the Department of Intangible Cultural Heritage. “Goryosha,” Imperial carriages, refers to special railway cars and automobiles used by Japanese Emperors and other members of the Imperial family. Since railways were introduced in Japan in the Meiji Period, the imperial carriages have been created. The first Imperial carriage is considered to have great cultural and artistic value, therefore, it has been designated as an Important Cultural Property. However, information on the object was not readily available. 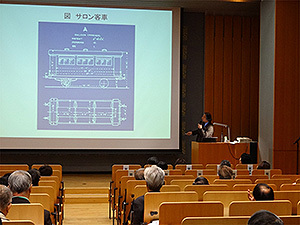 Thus, the Center for Conservation Science and Restoration Techniques held a study meeting entitled “Conservation and Restoration of Goryosha, Japanese Imperial Carriages” in the Institute’s basement seminar hall on November 30, 2012. The imperial carriages are said to be “moving works of art and craft” or “distillations of the culture of the Meiji Period.” They were specifically made for the Imperial family to use by employing the latest technologies and techniques at that time, so their furnishings and other features are extraordinary and remarkable. The carriages currently on display are 6 at the Railway Museum and 2 at the Museum Meiji-Mura. However, visitors are only able to look at their furnishings and exquisite interior decoration details through glass. At the study meeting, firstly, a specialist of industrial heritage talked about the technical aspects of the Imperial carriages and the development of the railways in Japan. Secondly, curators of the 2 museums preserving and displaying the Imperial carriages presented the characteristic furnishings and interiors of the objects. They also revealed approaches to and difficulty with daily maintenance and the way to display. Then, 2 conservators who worked to restore the Imperial carriages on display at the Railway Museum talked about actual restoration work done on the objects. It was worthy of special mention that an expert of industrial cultural heritage from Taiwan reported the Imperial carriages that were produced and left in Taiwan under Japanese rule between 1895 and 1945. The study meeting focused on not only the technical viewpoint of conserving railway cars, but also their cultural value in terms of the history of art and craft. The meeting had over 53 attendees and ended with a lively question and answer session with the presenters. The Japan Center for International Cooperation in Conservation surveys Japanese artworks in collections of art museums overseas and it provides those institutions with advice and information on relevant research. The Center also conducts cooperative conservation programs for artworks that urgently or desperately need to be conserved. In countries far removed from Japan where the climate, environment, racial makeup, and religion differ considerably, seeing the state of Japanese artworks instills in one the vitality of cultural properties, despite their fragile composition. 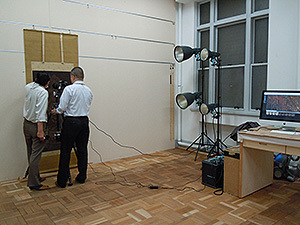 In November 2012, KAWANOBE Wataru, KATO Masato, and EMURA Tomoko surveyed Japanese artworks in the Republic of Armenia and Georgia. Both countries were once part of the Soviet Union, and 2012 marked the 20th anniversary of their establishing diplomatic relations with Japan. However, this survey was the first on-site survey of Japanese art by personnel from the Institute. Japanese artworks in the History Museum of Armenia, the National Gallery of Armenia, and the Charents House-Museum were surveyed. These museums have ukiyo-e (woodblock) prints from the late Edo Period and early modern to modern craftworks. That said, some of the works are not properly identified since their title or date of production is unclear. The Center provided advice and information regarding these works. 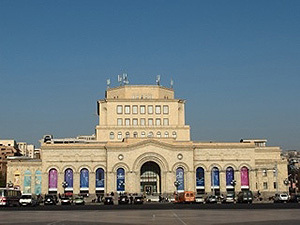 Additionally, the state of conservation of cultural properties in the Matenadaran (the Mesrop Mashtots Institute of Ancient Manuscripts) and the National Library was also studied. In Georgia, Japanese artworks primarily in the National Museum were surveyed. The National Museum has armaments from the Edo Period, such as armor and swords, as well as Japanese artworks like ukiyo-e paintings, pottery, and textiles. The museum was found to have 2 silk hanging scrolls, “Carps” by TACHIHARA Kyosho (1786–1840), a painter from the late Edo Period, and “Mt. Fuji” by TAKASHIMA Hokkai (1850–1931), a painter active during the Meiji Period. Both works have been damaged by time and need extensive restoration. The first step, however, is to gather detailed information about these artworks and then coordinate the future programs with the museum staff. 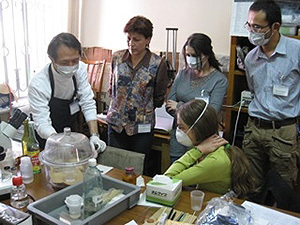 As part of the Networking Core Centers for International Cooperation in the Conservation of Cultural Heritage Project commissioned by the Agency of Cultural Affairs, the Japan Center for International Cooperation in Conservation conducted workshops on the conservation of archaeological metal objects in the History Museum of Armenia in November 2012 at the museum. The 3rd domestic workshop for Armenian experts was conducted November 6–17, and 8 of the participants had attended the previous workshop. Continuing from the previous workshop, the 3rd workshop expounded further on elemental analysis of metal surfaces using a handheld XRF analyzer following surface cleaning of archaeological metal objects to remove corrosion and deposit. Participants also practiced corrosion inhibiting, surface coating, adhering and filling defects. 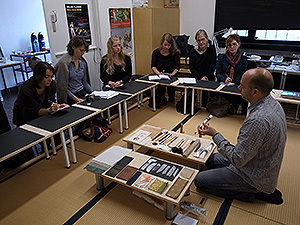 Participants learned techniques to treat materials in order to facilitate their conservation and display. 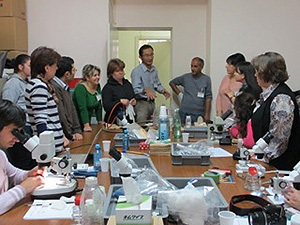 An international workshop was held with 4 Armenian experts as well as 6 expert invitees concerning archaeological metal objects from 5 countries—Georgia, Iraq, Kazakhstan, Kyrgyzstan and Russia. Also giving presentations were Armenian archaeologists and scientists who study archeological metals in Armenia. Attendees gave presentations on the study of Armenian metal objects and on the current state of museums and conservation in their own countries. The workshop contributed to foster the exchange of information and establish wider networks. The next set of workshops will cover advanced cases. 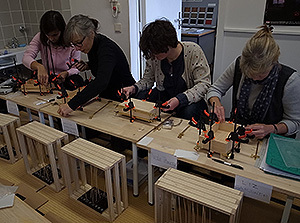 Plans are to summarize research on fabrication techniques and have participants use the conservation knowledge and skills they learned in previous workshops. As part of the UNESCO-/Japan Funds-in Trust project titled as “Support for documentation standards and procedures of the Silk Roads World Heritage Serial and Transnational Nomination in Central Asia”, a specialist training workshop on archeological site documentation was conducted in Tajikistan from November 2nd to the 7th by Japan Center for International Cooperation in Conservation in close collaboration with the Ministry of Culture, Tajikistan and Historic-Cultural Reserve “Hulbuk”, Tajikistan. Within the framework, a series of specialist training workshops have thus far been conducted in other Central Asian countries, such as Kyrgyz and Kazakhstan. The workshop in Tajikistan focused on practical training of site documentation at the ruins of the medieval city of Hulbuk (9th-12th century AD), which is currently on the tentative lists of the UNESCO World Heritage Site. In particular, on-site practical training of topographic survey and establishment of excavation grids as well as basic lectures on surveying were conducted, using total station that was supplied to the Tajik side from UNESCO. 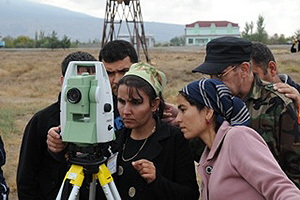 The six days short-term workshop was not always sufficient to obtain a mastery of the various survey skills, but attended ten Tajik participants made a serious effort to acquire the skills, using their own equipment. 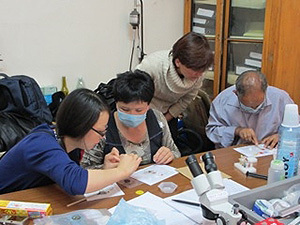 Japan Center for International Cooperation in Conservation will continue this supporting project for young Tajik experts in the next 2013 season. From November 6 to December 5, wall painting fragments in the National Museum of Antiquities of Tajikistan were conserved on-site. The wall painting fragments that are being conserved were excavated in 1984 from the palace ruins at Khulbuk in southern Tajikistan. The Khulbuk site dates to the early Islamic period. The fragments have been kept in the repository of the National Museum of Antiquities but for a long time they were not properly conserved. Serious conservation efforts began in 2010. The wall painting fragments are extremely fragile. 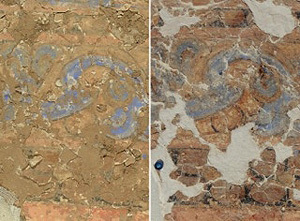 Pigments from multi-colored layers are merely resting on the fragments, and the plaster base coat has been severely fragmented. Following up on last year’s work to reinforce the multi-colored layers, work was done to stabilize assembled fragments by piecing them back together and attaching a new backing. 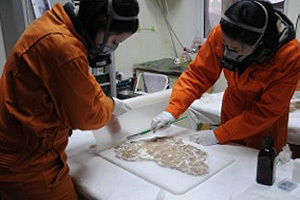 Approaches such as filling in the gaps in fragments that were stabilized last year were tested with the goal of exhibiting the fragments in the future. The wall painting fragments are easier to appreciate once they have been stabilized and pieced back together with the gaps filled. Plans are to examine ways to exhibit the fragments in the future. This conservation project was undertaken with a Sumitomo Foundation grant for the preservation and conservation of foreign cultural properties. Architectural survey group: In order to reveal the traditional techniques of rammed earth construction, multiple craftsmen were interviewed, and reinforce techniques for damaged houses, temples, and ruins with rammed earth structures were inspected and surveyed. Structural survey group: In order to quantitatively assess the performance of structures with rammed earth walls, specimens that Bhutanese personnel had prepared ahead of time were subjected to compressive strength testing. Micro-tremors were also measured at 2 small temple buildings of rammed earth structure. Basic data were obtained for analysis of the structural properties of those buildings. In addition to the current surveys, a workshop was conducted with Bhutanese counterparts in order to share the results of previous surveys (including prior cooperative projects involving Japanese personnel), as well as to introduce Japanese experiences for the conservation of traditional houses in Japan. 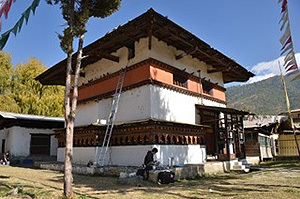 Through such activities, the Core Centers Project seeks to explore prospects for appropriate conservation of traditional buildings and continuation of building techniques and deal with the issue of improved safety in the event of an earthquake. The project also seeks to train local personnel who are responsible for preserving cultural heritage. 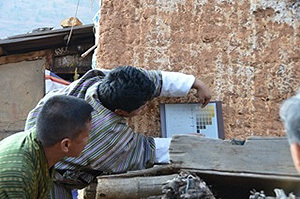 Hopes are to further enhance cooperation by transferring basic techniques through architectural surveys and structural analysis to eager Bhutanese personnel.